Positioned at Southern Vectis Travel Shops at Ryde and Newport, at all major travel links (Island and mainland) and at the Visit Isle of Wight information centre, we encourage customers to pick up a timetable from the bin when it is needed and to put it back for the next person when finished - reusing & recycling each timetable in order to minimise print numbers. Printed on paper from sustainably grown trees, for summer 2019 timetable printing will be capped at just 75k, compared to 125k in Summer 2018 and 350k (approx.) bus journeys a month. 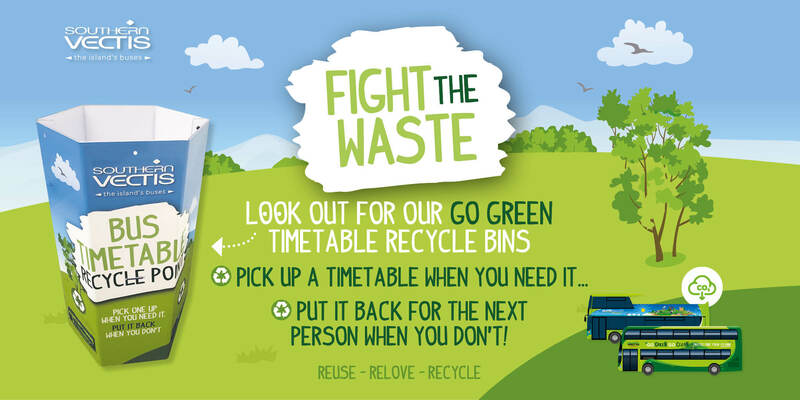 In addition to the recycle bins, efforts will be made to encourage customers to start checking and downloading timetables online in order to reduce print numbers again come winter 2019, and again by summer 2020.